Do you have active little ones that are constantly looking for something to do? Do they like to climb? 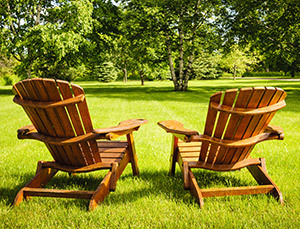 Are they too small yet for a swing set but need something more than the couch to climb on? Then you might need the Little Tikes First Slide. This slide may not look like much to you or to your older kids. But to the littlest members of your family it is sure to provide hours of fun and excitement. Designed by the US company Little Tikes, this slide is built to promote balance and coordination as well as encourage fitness in children. The First Slide is constructed of a durable plastic that this brand is known for. It is safe, sturdy, and perfect even for kids as young as 10 months old. However, the company recommends that it not be used until kids are at least 1 ½ years old. 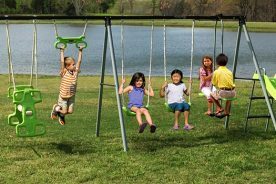 Even if you do have a swing set with a larger slide, this smaller version might be just what your kids need to gain the confidence and skills to use the bigger slide later. What Makes the First Slide Great? There are lots of small slides on the market with this same design and structure. The thing that makes this one great is that it is built by a trusted brand – Little Tikes. They have been in business since 1970, manufacturing plastic toys for kids of all ages. 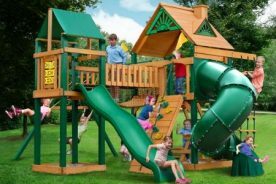 Best known for their playhouses, slides, climbers, and ride-ons, their toys are designed to be durable, safe, and promote imaginative, active play. The First Slide is no exception and should not to be confused with the Little Tykes First Slide, which is simply a common misspelling. It is perfectly sized for younger kids and makes a great slide for beginners. Parents think it’s great too because it is easy to assemble by simply snapping a few pieces together, absolutely no tools required. In fact, if it were not for the other languages, the instruction manual for this toy would only be half a page long. Another great aspect of this slide is that it is easy to store when it’s not in use. The steps can be easily removed from the slide by merely pulling them away from the slide portion. They then fit flush with the back of the slide so they are more compact for carrying. 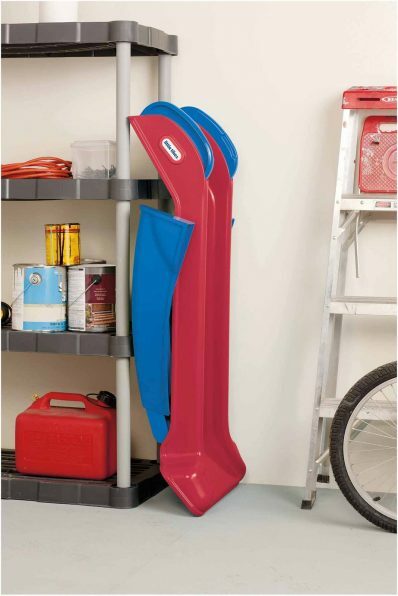 This design also allows the toy to take minimal space in your garage, basement, or shed during storage. Lastly, no matter where you live, kids will be able to enjoy the slide all year around. During the cold winter months, it can be brought indoors. But it can also stay outdoors when the weather is nice for some outside fun and exercise. As long as it is used safely on a level surface with a relatively soft place to land at the bottom, you can use the First Slide almost anywhere. How Big is the LT First Slide? It can either be seen as an advantage or disadvantage, depending on your expectation, but the LT First Slide is not very large. However, what it lacks in size it makes up for in safety and reliability. And for some its size is exactly what you are looking for. Whether you have a small backyard or even no backyard, you can use this slide. Even those living in an apartment find room for it on a patio or in the middle of the living room. This slide is recommended for children ages 1 ½ to 4 years of age. It has a weight limit of 60 pounds. Most comparable slides only support up to 50 lbs., making this one the one to get if you want it to last longer. Does the Slide Come with Any Options? This particular slide does not come with any options. What you see is what you get. 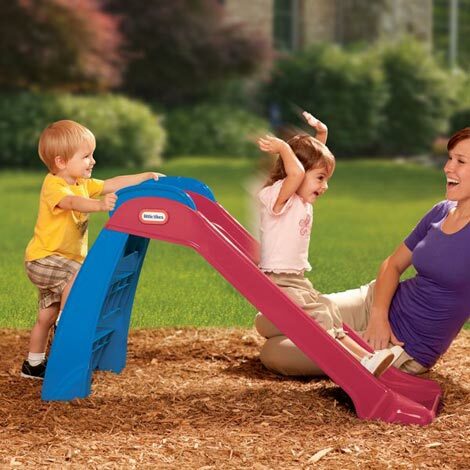 Currently, Little Tikes makes this slide in only red with blue steps. At one time they manufactured one that was pink with purple steps. But in order to find this discontinued model you will need to look on Amazon or find it on resale on sites like Ebay or Craigslist. The only other option for this slide is to upgrade to the Wet & Dry First Slide. On this Little Tikes toy you will find that the slide itself is just like the First Slide. But this model comes with an attached water slide. A 10-foot-long vinyl mat with a fun animal display can be attached to the end of the slide to make it a perfect outdoor toy for those hot summer days. 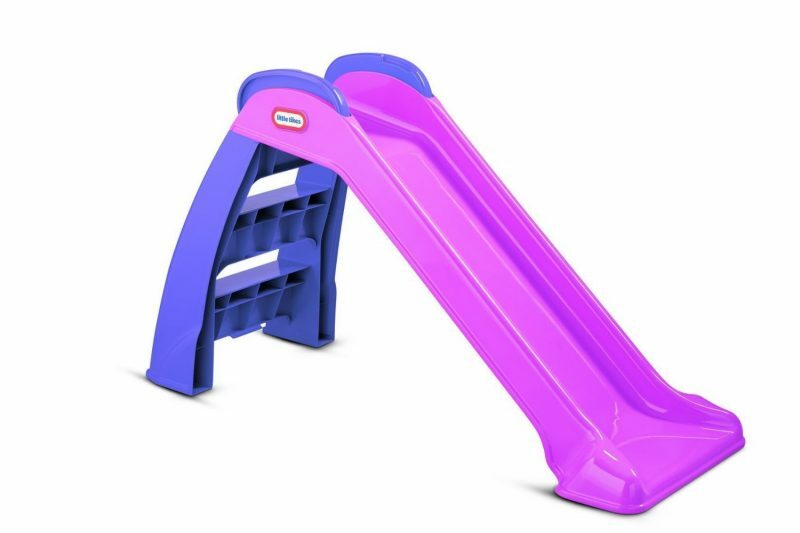 While the Wet & Dry Slide comes in a different color scheme, yellow with blue steps and purple handles, the dimensions and convenient storage are exactly the same. In fact, as long as the water slide is not attached you can use this slide both indoors and outdoors. However, the water slide should only be used outdoors on a soft surface. Where Can I Buy the Little Tikes Slide? 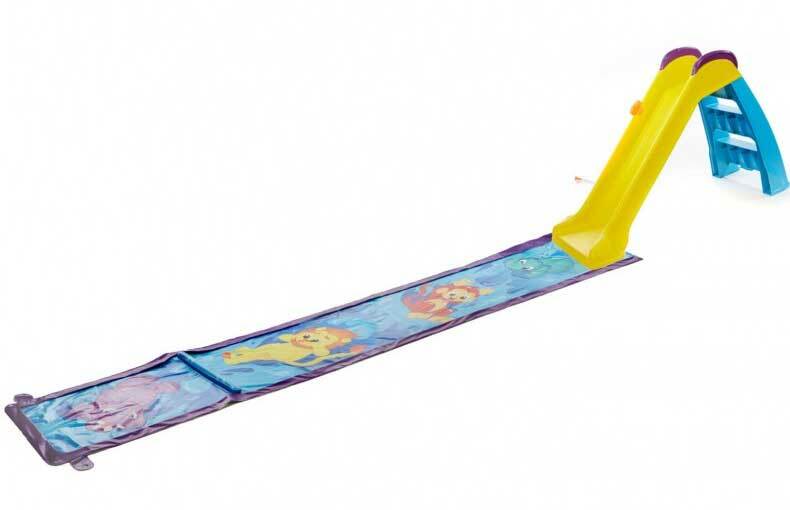 Like all of their quality products you can purchase this slide online directly from Little Tikes. It is also available at several online retailers. Many of these retailers carry the First Slide in their stores for your convenience. But if you cannot find it in your area it is readily available online and often with free shipping. The slide typically sells for anywhere from $27 up to $35. Shipping costs and sales tax will vary depending on your location and whether or not you ship it to your home or to a store to be picked up later. The rarer purple and pink slide sells for around $180 unless you find a used one for a much cheaper price. The water slide is approximately $50. Perfect for the little tikes in your family, the First Slide comes from a trusted brand. Its size, durability, price and easy storage make it a great product. 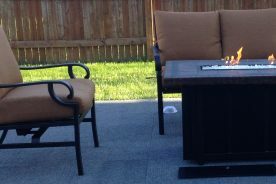 It is safe for the littlest members of the family and designed to use indoors, in the backyard, or even on the patio outside an apartment.